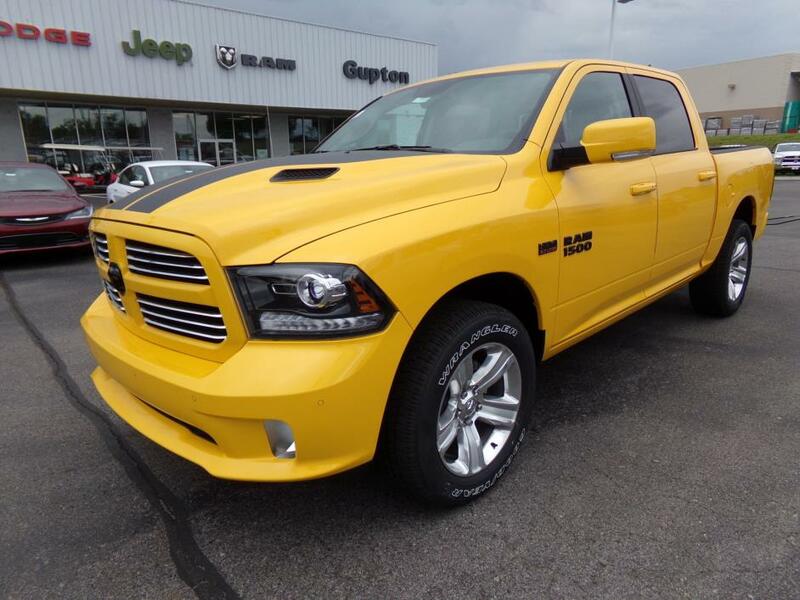 1500 Sport, Sport, Drive this home today! Check out this 2017! It delivers style and power in a single package! This model accommodates 5 passengers comfortably, and provides features such as: power moon roof, rain sensing wipers, and power seats. Smooth gearshifts are achieved thanks to the powerful 8 cylinder engine, and for added security, dynamic Stability Control supplements the drivetrain. Four wheel drive allows you to go places you've only imagined. Our knowledgeable sales staff is available to answer any questions that you might have. They'll work with you to find the right vehicle at a price you can afford. We are here to help you., Power Sunroof,Bucket Seats,Remote Proximity Keyless Entry,Class IV Receiver Hitch,115V Auxiliary Power Outlet,Folding Flat Load Floor Storage,Integrated Voice Command w/Bluetooth,Trailer Tow Mirrors,GPS Antenna Input,Remote USB Port,Media Hub,Uconnect Access,Power Lumbar Adjust,Next Generation Engine Controller,Sport Performance Hood,Leather Trimmed Bucket Seats,SIRIUSXM Satellite Radio,Full Length Upgraded Floor Console,Engine: 5.7L V8 HEMI MDS VVT,5-Year SIRIUSXM Travel Link Service,HD Radio,Ventilated Front Seats,Rear 60/40 Split Folding Seat,Dual Rear Exhaust w/Bright Tips,Heavy Duty Engine Cooling,Radio: Uconnect 8.4 NAV,GPS Navigation,Power 10-Way Driver and 6-Way Passenger Seats,9 Alpine Speakers w/Subwoofer,Anti-Spin Differential Rear Axle,High Back Seats,Active Grille Shutters,Uconnect Access 1 Year Trial,Tip Start,Single Disc Remote CD Player,Power Black Trailer Tow Mirrors,SIRIUSXM Travel Link,Engine Oil Heat Exchanger,Electronically Controlled Throttle,Rotary Shifter-Bright,1 Year Trial,Keyless Go,Trailer Tow Mirrors and Brake Group,ParkSense Front/Rear Park Assist System,Quick Order Package 27L Sport,5-Year SIRIUSXM Traffic Service,32 Gallon Fuel Tank,Auto High Beam Headlamp Control,Heated Steering Wheel,Rain Sensitive Windshield Wipers,Trailer Brake Control,Transmission: 8-Speed Automatic,Convenience Group,Black Exterior Mirrors,Heated Front Seats,Spray In Bedliner,Electronic Shift,Audio Jack Input for Mobile Devices,Premium Sound Group,50 State Emissions,8.4' Touchscreen Display,SIRIUSXM Traffic Drive this home today! Check out this 2017! It delivers style and power in a single package! This model accommodates 5 passengers comfortably, and provides features such as: power moon roof, rain sensing wipers, and power seats. Smooth gearshifts are achieved thanks to the powerful 8 cylinder engine, and for added security, dynamic Stability Control supplements the drivetrain. Four wheel drive allows you to go places you've only imagined. Our knowledgeable sales staff is available to answer any questions that you might have. They'll work with you to find the right vehicle at a price you can afford. We are here to help you. 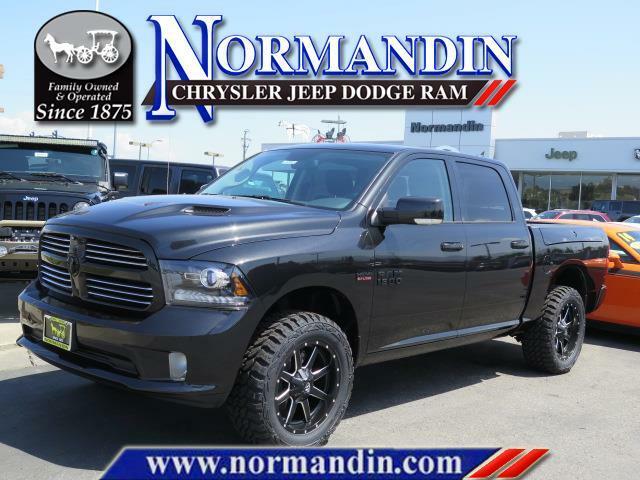 1500 Sport, Sport, This vehicle won't be on the lot long! This is a superb vehicle at an affordable price! Top features include rain sensing wipers, an outside temperature display, turn signal indicator mirrors, and voice activated navigation. It features an automatic transmission, 4-wheel drive, and a refined 6 cylinder engine. We pride ourselves in the quality that we offer on all of our vehicles. 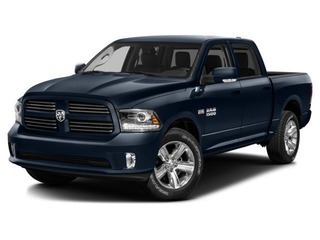 Please don't hesitate to give us a call., 1 Yr. Trial,SIRIUSXM Travel Link,Engine: 3.6L V6 24V VVT,Cloth Bucket Seats,Remote Proximity Keyless Entry,Class IV Receiver Hitch,Integrated Voice Command w/Bluetooth,GPS Antenna Input,Remote USB Port,Keyless Go,Media Hub,Uconnect Access,5-Year SIRIUSXM Traffic Service,SIRIUSXM Satellite Radio,3.55 Rear Axle Ratio,Quick Order Package 22L Sport,Auto High Beam Headlamp Control,Rain Sensitive Windshield Wipers,5-Year SIRIUSXM Travel Link Service,Transmission: 8-Speed Automatic,HD Radio,Convenience Group,Rear Window Defroster,Radio: Uconnect 8.4 NAV,GPS Navigation,Anti-Spin Differential Rear Axle,Audio Jack Input for Mobile Devices,Uconnect Access 1 Year Trial,8.4' Touchscreen Display,50 State Emissions,SIRIUSXM Traffic This vehicle won't be on the lot long! This is a superb vehicle at an affordable price! Top features include rain sensing wipers, an outside temperature display, turn signal indicator mirrors, and voice activated navigation. It features an automatic transmission, 4-wheel drive, and a refined 6 cylinder engine. We pride ourselves in the quality that we offer on all of our vehicles. Please don't hesitate to give us a call. This vehicle won't be on the lot long! A durable pickup truck seating as many as 5 occupants with ease! It includes leather upholstery, voice activated navigation, power moon roof, and 1-touch window functionality. 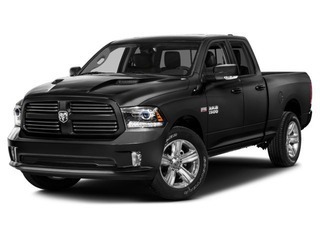 Under the hood you'll find an 8 cylinder engine with more than 350 horsepower, and for added security, dynamic Stability Control supplements the drivetrain. Four wheel drive allows you to go places you've only imagined. We have the vehicle you've been searching for at a price you can afford. Stop by our dealership or give us a call for more information. 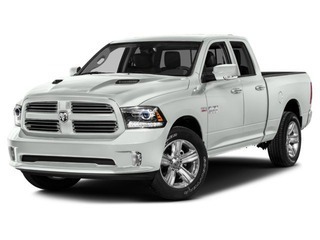 1500 Sport, Sport, This Ram won't be on the lot long! 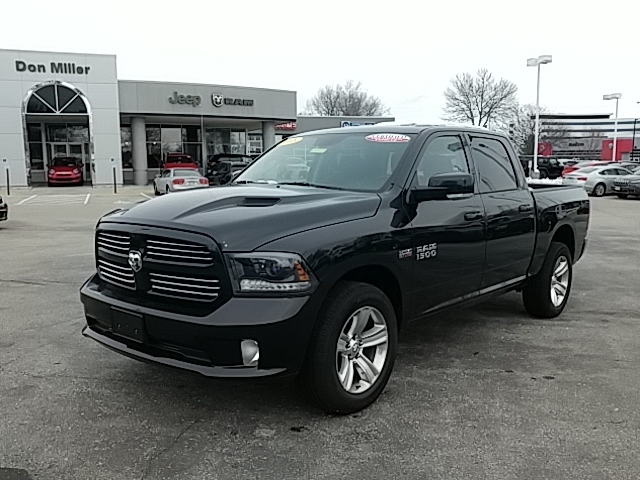 A great truck at a great price! This model accommodates 5 passengers comfortably, and provides features such as: voice activated navigation, adjustable pedals, and more. We know that you have high expectations, and we enjoy the challenge of meeting and exceeding them! Stop by our dealership or give us a call for more information., Bucket Seats,Black Ram Head Tailgate Badge,1 Yr. Trial,Class IV Receiver Hitch,Folding Flat Load Floor Storage,Ignition Orange Sport Package,Integrated Voice Command w/Bluetooth,GPS Antenna Input,Remote USB Port,Media Hub,Uconnect Access,Power Lumbar Adjust,Next Generation Engine Controller,Deluxe Cloth High-Back Bucket Seats,Sport Performance Hood,SIRIUSXM Satellite Radio,Full Length Upgraded Floor Console,Flat Black 5.7L Hemi Badge,Engine: 5.7L V8 HEMI MDS VVT,5-Year SIRIUSXM Travel Link Service,HD Radio,Rear 60/40 Split Folding Seat,Heavy Duty Engine Cooling,Radio: Uconnect 8.4 NAV,GPS Navigation,Tires: P275/60R20 OWL AS,Center Hub,Flat Black Ram 1500 Badge,Anti-Spin Differential Rear Axle,High Back Seats,Quick Order Package 26L Sport,Active Grille Shutters,Uconnect Access 1 Year Trial,Tip Start,SIRIUSXM Travel Link,Engine Oil Heat Exchanger,4x4 Flat Black Badge,Electronically Controlled Throttle,Wheels: 20' x 9' Semi-Gloss Black Aluminum,5-Year SIRIUSXM Traffic Service,Bright Rotary Shifter,Transmission: 8-Speed Automatic,Full Size Temporary Use Spare Tire,Body Color/Bright Billets Grille,Electronic Shift,Wheels: 20' x 9' Polished Aluminum,MOPAR Sport Performance Hood Decal,Audio Jack Input for Mobile Devices,50 State Emissions,8.4' Touchscreen Display,Heated Seats and Wheel Group,SIRIUSXM Traffic This Ram won't be on the lot long! 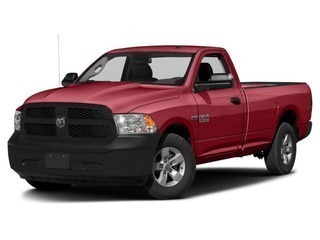 A great truck at a great price! This model accommodates 5 passengers comfortably, and provides features such as: voice activated navigation, adjustable pedals, and more. We know that you have high expectations, and we enjoy the challenge of meeting and exceeding them! 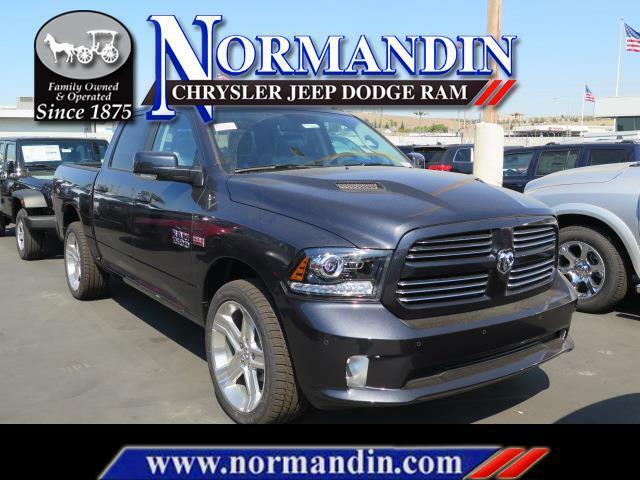 Stop by our dealership or give us a call for more information. 1500 Sport, Sport, The vehicles with listed dealer discounts are already discounted to an eprice ., Power Sunroof,Bucket Seats,1 Yr. Trial,115V Auxiliary Power Outlet,Folding Flat Load Floor Storage,Integrated Voice Command w/Bluetooth,GPS Antenna Input,Remote USB Port,Media Hub,Uconnect Access,Power Lumbar Adjust,Next Generation Engine Controller,Sport Performance Hood,Leather Trimmed Bucket Seats,SIRIUSXM Satellite Radio,Full Length Upgraded Floor Console,Engine: 5.7L V8 HEMI MDS VVT,5-Year SIRIUSXM Travel Link Service,HD Radio,Ventilated Front Seats,Rear 60/40 Split Folding Seat,Wheels: 22' x 9' Forged Aluminum Polished,Dual Rear Exhaust w/Bright Tips,Heavy Duty Engine Cooling,Radio: Uconnect 8.4 NAV,GPS Navigation,Center Hub,Power 10-Way Driver and 6-Way Passenger Seats,9 Alpine Speakers w/Subwoofer,High Back Seats,Quick Order Package 26L Sport,Active Grille Shutters,Uconnect Access 1 Year Trial,Tip Start,SIRIUSXM Travel Link,Engine Oil Heat Exchanger,Electronically Controlled Throttle,ParkSense Front/Rear Park Assist System,5-Year SIRIUSXM Traffic Service,Bright Rotary Shifter,Heated Steering Wheel,Transmission: 8-Speed Automatic,Full Size Temporary Use Spare Tire,Heated Front Seats,Electronic Shift,Spray In Bedliner,Tires: P285/45R22 BSW AS,Audio Jack Input for Mobile Devices,GVWR: 6,200 lbs,Premium Sound Group,50 State Emissions,8.4' Touchscreen Display,SIRIUSXM Traffic The vehicles with listed dealer discounts are already discounted to an eprice . 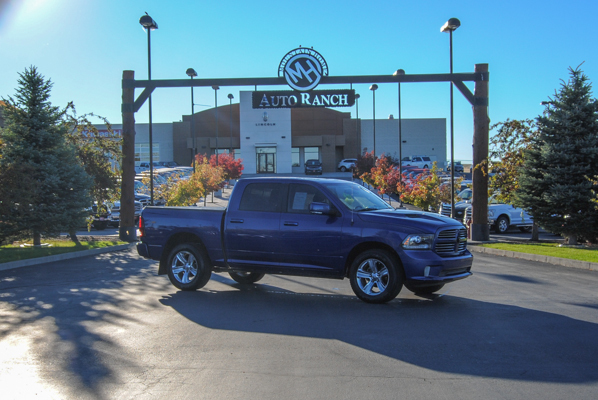 Thank you for viewing our new 2017 Ram 1500 Crew Cab Sport Truck! There are currently $2500 in Southeastern Region Cash Rebates. You may qualify for many other rebates. Rebates are scheduled to expire on 11/30/2016. Call or email now to confirm your rebates and get your true ePrice!